Two workplace shootings in two days. Two different attackers -- one, a middle-aged man who fired at his coworkers at a software firm in Wisconsin -- the other, a young woman who shot dead three employees at the Maryland warehouse where she worked. But on Friday, a common thread emerged between both shootings: mental illness. Snochia Mosely, 26, the Maryland shooter who fired at the 65 other employees who were present Thursday at a Rite Aid distribution center, had been diagnosed with a mental illness in 2016, Harford County Sheriff Jeffrey Gahler said at a press conference Friday. "Friends said she was increasingly agitated over the past few weeks and they were concerned for her well-being," the sheriff said. 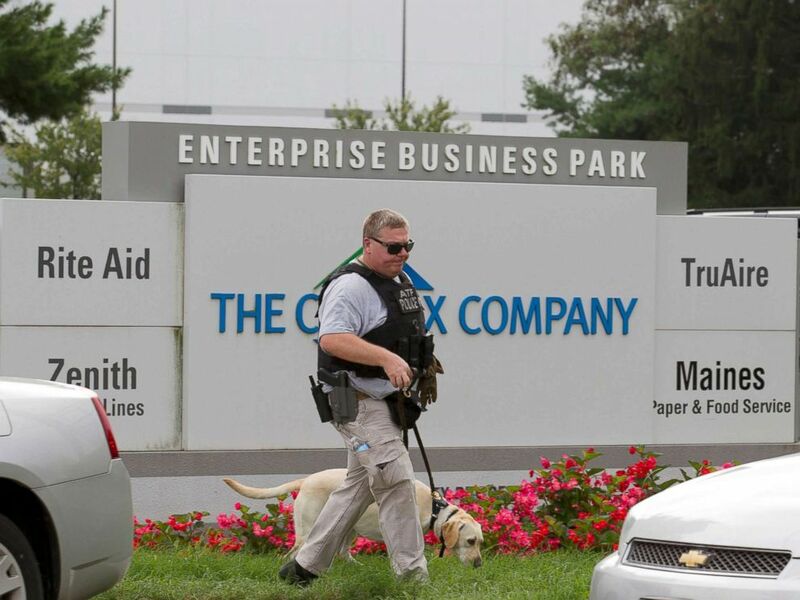 ATF police officer with a sniffing dog walks out the industrial complex in Harford County, Md., Sept. 20, 2018. She used a Glock 17 9mm handgun that she had legally purchased in March 2018 and had a valid license for. Gahler said her mental illness didn't bar her from obtaining a gun. The Wisconsin gunman, 43-year-old Anthony Tong, had "contact" with police in South Dakota in 2004 that involved a mental health issue, Middleton Police Chief Chuck Foulke said Friday. Tong's concealed-carry permit had been revoked and he was unable to legally purchase a firearm, said Foulke, who cautioned against using Tong's illness as an excuse for the shooting. Mosely, a temporary employee who had worked at the Rite Aid center for two weeks, had reported for work as usual at 6:30 in the morning on Thursday, Gahler said. While entering, she had a minor altercation with another co-worker who had exchanged words with her about "butting in line," although Gahler said that disagreement wasn't major enough to explain her actions. Less than an hour later, she left for home, returning at 9:05 a.m. in a hooded shirt, armed with her handgun, three magazines, pepper spray and a pair of handcuffs. "She was moving pretty quickly, not taking a lot of time to aim," Gahler said. "You don't have to be highly accurate when you're in close quarters." 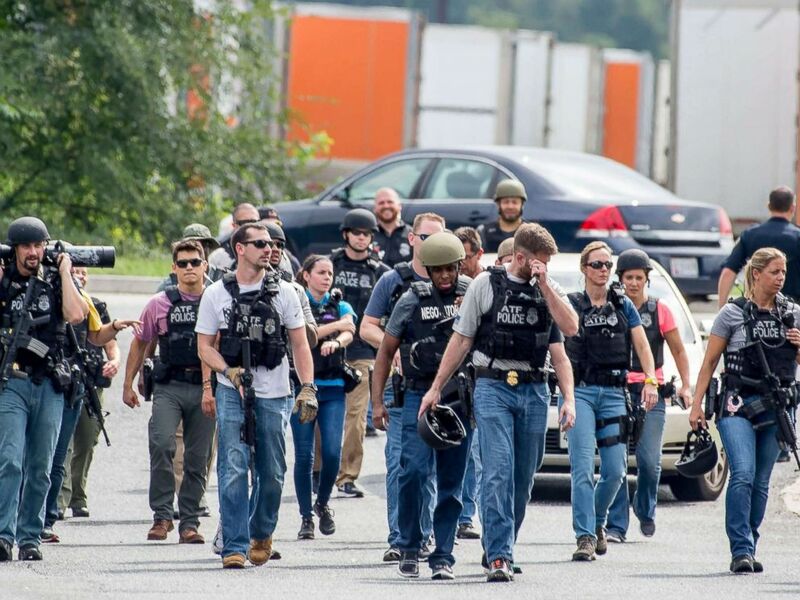 Agents on patrol after clearing an area near a warehouse as police search for a gunman who fled the scene of a shooting at a Rite Aid Distribution Center in Aberdeen, Maryland,Sept. 20, 2018. Three people -- Sunday Aguda, 45, Brindra Giri, 44, and Hayleen Reyes, 41, died from their gunshot wounds. Three others -- Hassan Mitchell, 19, Wilfredo Villegas, 45, and Acharya Purna, 45 -- were critically wounded but are expected to survive. Mosely was killed by the self-inflicted gunshot wounds to her head. "We learned yesterday no community is immune from this kind of heinous violence," Gahler said. "What makes a person capable of taking a weapon and using it against unarmed, defenseless people? It's senseless. We're never going to understand it." 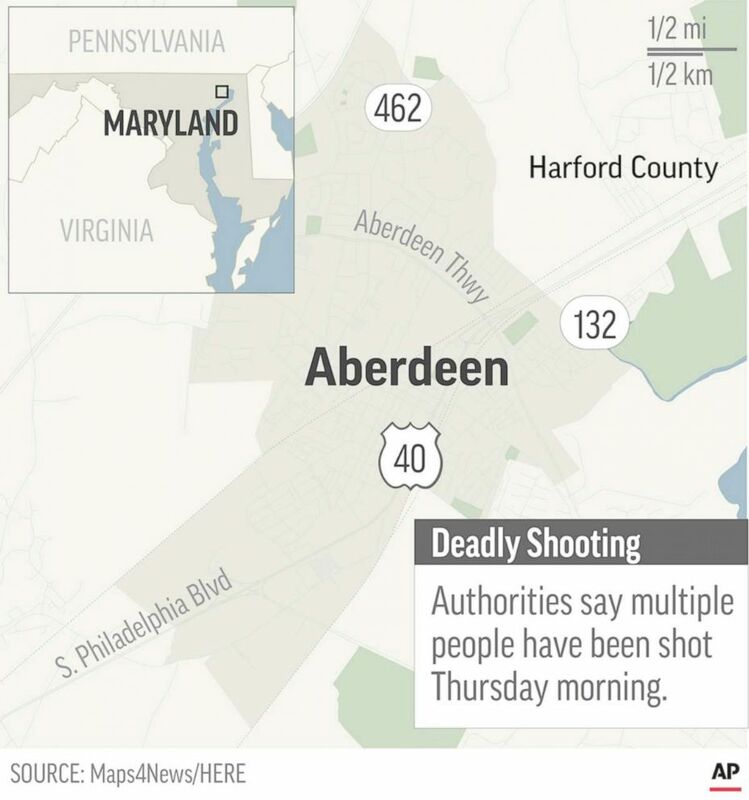 Map locates Aberdeen, Maryland, where a mass shooting has been reported. In the Wisconsin shooting, Tong shot and seriously wounded three coworkers before police killed him in a shoot-out at WTS Paradigm, a software firm in Middleton, located about six miles outside of Madison. Foulke said police still don't know what motivated the attack. "He came to work that day on a normal basis and was working when this happened," Foulke said. "I just don't know. Motive is the huge thing that everybody wants to know." The police chief said the Bureau of Alcohol, Tobacco, Firearms and Explosives was trying to track down the origin of the 9mm semiautomatic pistol used in the attack. "There's something unique about that weapon that they're having trouble finding out where it came from and what hands it passed through," Foulke said. Wisconsin authorities also said Friday that the conditions of the three seriously wounded workers had improved. The woman and two men have been upgraded from serious to fair condition at University Hospital in Madison, according to UW Health.